Pauline Katz filled a chair with Fluff for a game of musical chairs during the “What the Fluff?” Festival. What’s all the Fluff about? 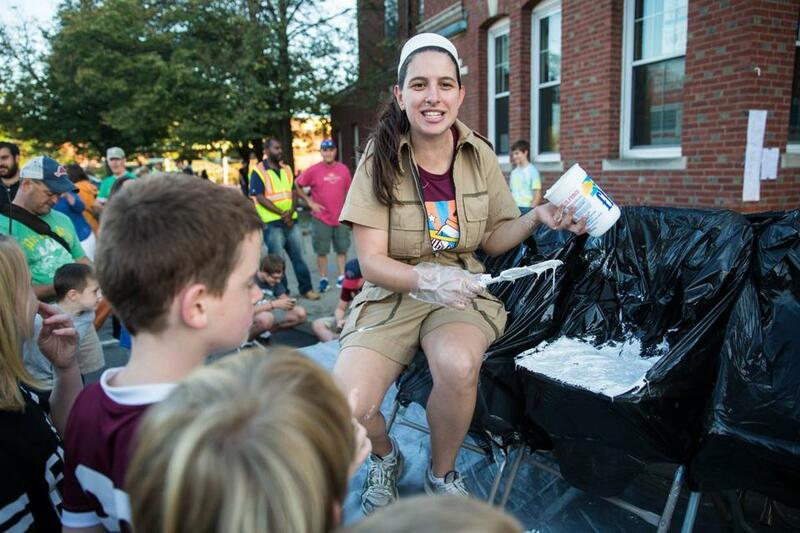 Somerville hosted the 12th annual “What the Fluff?” Festival Saturday afternoon, a tribute to the marshmallow treat invented in Union Square by Archibald Query. This year’s festival commemorated the 100th anniversary of Query’s invention. With a theme of “Fluff Centennial: Inspiring the Next Century of Union Square Invention,” the event featured bands, a cooking contest, and “Fluffacious games,” said Esther Hanig, executive director of Union Square Main Streets. It also had an “Invention Alley” to showcase modern innovation. Invention Alley offered activities based on robotics, a 3-D pen, and laser etching, among others. The Somerville High School robotics team and Artisan’s Asylum were behind the project. Hanig also cited Greentown Labs, and Bow Market — a food, art, and retail market set to launch in January — as examples of local innovation. Despite the modern theme, Hanig said people are drawn to Fluff because it reminds them of simpler times. “I think that people really associate it with growing up in childhood, and they have all sorts of light, nostalgic memories,” Hanig said.